Banks are a safe place to keep money. But “safe” means different things to different people—and the risks can change over time. Finding the safest banks and credit unions for your money is a matter of evaluating the risks, choosing which risks to manage, and deciding how much work you’re willing to do to protect your money. Backing from the United States government is a basic form of safety that most people depend on. If your financial institution fails and your savings are covered, you won’t lose money. For most people, that’s sufficient protection, and they don’t think any more about the complexities. For banks, FDIC insurance is the government-backed program that insures deposits. Funds are covered up to $250,000 per depositor per institution. It’s always wise to verify that your bank is insured and to understand what happens with different types of accounts (such as joint accounts and retirement accounts)—especially if you have more than $250,000. For federally insured credit unions, which are just as safe as FDIC-insured banks, members can rely on NCUSIF insurance protection. Again, you need to be sure that your accounts are covered and that you’re below the maximums. If your bank or credit union fails and your funds are insured, your money is safe. The federal government, with backing from the US Treasury, can replace any money that was lost by the bank. This process is generally fast (within a business day), and many people never even notice that their bank failed until the name changes to a successor bank, but there can be delays and inconveniences. If you have more than $250,000, it’s essential to spread those funds among different insured banks or among different account titles. While government guarantees provide solid protection for your money, some people prefer to pick and choose among government insured institutions for added safety. They might not want to take the risk of potential inconveniences, or they might have uninsured funds in excess of the maximum limits. 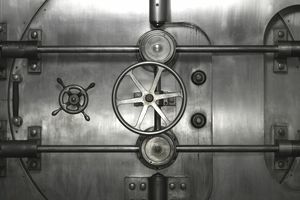 There are several private companies that rate banks and assign a rating that is supposed to help you figure out if the bank is safe. These services can be helpful, but things can change quickly (possibly faster than the rating services can update) and you need to check up-to-date ratings regularly. For many, repeated checkups are cumbersome, so be honest about your likelihood to do this and put those checkups on your calendar. Bankrate Safe and Sound ratings are designed to help you determine which banks are safest. Bankrate evaluates banks based on capital adequacy, asset quality, profitability, and liquidity, and assigns a “star” rating to each bank. Visit Bankrate.com for more information. BauerFinancial is another service with an easy-to-use star system. The safest banks are 5-star rated. BauerFinancial includes ratings on credit unions, and you can search by typing in the name of your financial institution. Find out more at BauerFinancial.com. Rating services look at various sources of data to come up with a “grade,” but you might not see all of the work or assumptions behind that grade. If you want to take a more hands-on approach, you can do your own calculations. Evaluate how strong your bank is, and look for signs of trouble. One calculation often used for evaluating banks is the Texas Ratio, which looks at how likely bad loans are to drag the bank down. Banks invest the money you deposit, lending it out (among other things). The safest banks have a Texas Ratio well below 100% (or 1:1). They are better able to absorb losses on defaulted loans. Some people believe in the concept of ‘too big to fail.' In other words, they believe that the safest banks are the largest banks with tentacles reaching into many parts of the economy. The idea is that governments will prop up these banks and prevent them from failing. To compete with the ‘too big to fail’ banks, smaller banks have gotten creative. For example, the CDARS program allows CD investors to make large deposits (above FDIC limits) at a smaller institution and still get full FDIC coverage. Although the view is not necessarily mainstream, there are some who believe that smaller institutions (that are not too-big-to-fail) are the safest places to keep your money. The concern is that large financial institutions such as global banks take on much more risk (and different types of risks) than small community credit unions. If they were to fall on hard times, some fear that those institutions would take funds from your account to meet other obligations. This occurrence is not likely, and there are other forms of “bail-ins” that banks can use before they dip into your personal account and seize your savings. That said, anything is possible, and we don’t know what we don’t know about the future. If you want to be especially cautious, it might (or might not) make sense to plan for these types of events. If you’re concerned about a robbery, be aware that most robberies go unnoticed by the majority of customers and even bank staff (and theft is increasingly moving online, but you are often protected from errors and fraud). If you ever are involved in a robbery, follow some key rules on how to handle yourself. Most importantly, don’t try to be a hero. Many banks insure against funds lost in a robbery. Feel free to ask any bank you’re thinking of working with what kind of coverage is in place before you open an account.